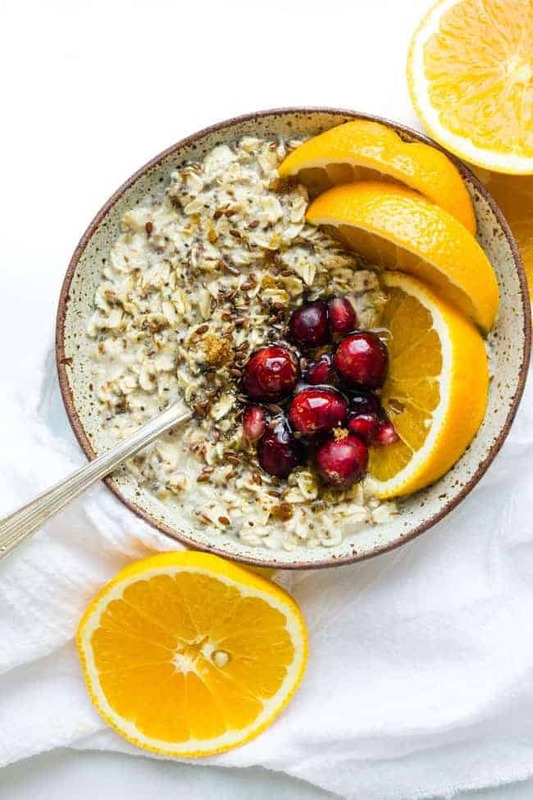 This Cranberry Orange Oatmeal Bowl is the perfect breakfast for when you still want something light with elevated flavor. Seriously guys, my routine is off if I don’t start my day off with a big ol’ bowl of oatmeal. It’s a staple in my life. It’s hearty. It’s quick and easy. And I’ve learned how to dress it up enough to not have it end up a boring bowl full of tasteless mush. I love that I can just throw everything into a bowl and have a healthy breakfast made in just a few minutes. Of course though, my family makes fun of me for how much oatmeal I eat. They assume something’s wrong with me on the random occasion I don’t get a bowl in. But with all the variations I’ve made on oatmeal, I’m bound to never get bored with my bowl of oats. What are some different ways I can make oatmeal? 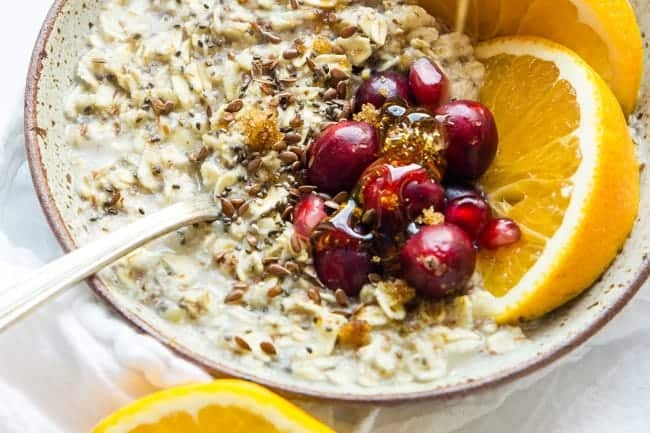 I traditionally just load up my oats with raisins (or craisins), flax seeds, wheat germ, and a hefty scoop of nut butter, but I also like to switch it up. I’ve made an Pumpkin Oat Breakfast Bowl and a Sweet Dark Chocolate Chili Oatmeal. They’re a couple of my favorites. And if you want your oatmeal in dessert form, I’d probably go for these Healthy Iced Oatmeal Cookies for starters. 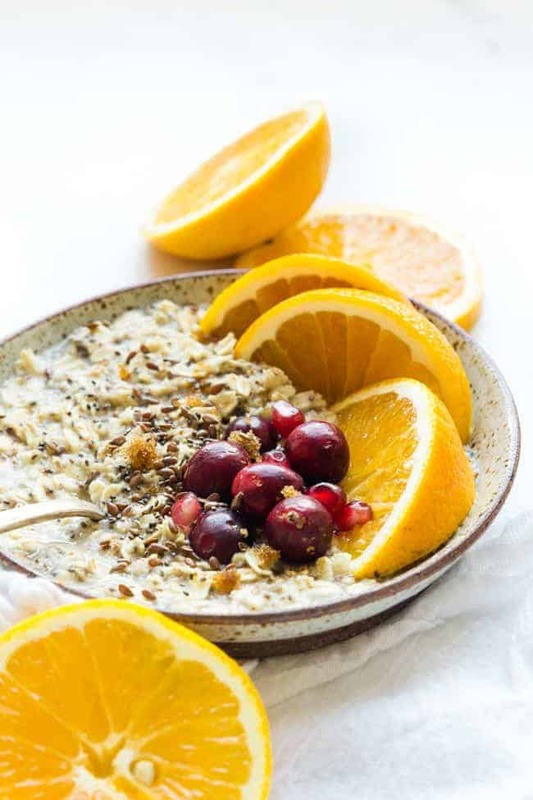 Can I make this oatmeal for a crowd? You can absolutely make this oatmeal for more than one person. Simple math will get you to where you need to go. For 4 servings, multiply all ingredients by 4. Basically you’ll want a 2:1 ratio of water to oats. So 4 servings would be 4 cups water and 2 cups oats. And then just multiply all other ingredients by 4. In a medium saucepan or small stock pot, add all ingredients. Bring the water to a boil and then reduce heat to medium low. Simmer for 2-3 minutes until most water has been absorbed. Allow to sit for a couple of minutes before serving. Another one of my favorite ways to make oatmeal is my friend Mary’s Holiday Oatmeal. I made it last year for Christmas morning, and I’m pretty sure it’ll be happening again this year. Try it out if you haven’t already! Post your bowl on Instagram (IG stories works too!) and tag me (@happyfoodholly). I’ll be sure to share your creation! 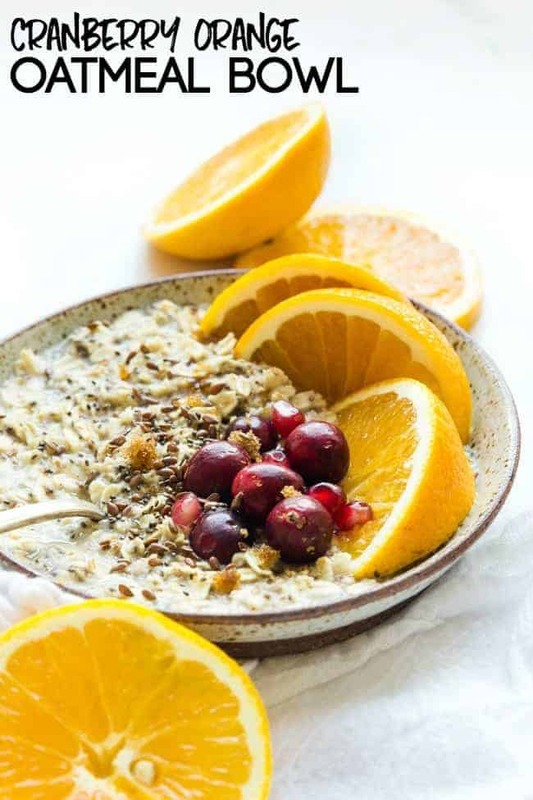 Combine oats, water, orange juice, flax seed, dried cranberries, chia seeds, wheat germ, and orange zest in a microwave-safe bowl, about double the size of all the ingredients so nothing overflows. Carefully remove from microwave and drizzle with agave, honey, or maple syrup. Top with almond milk or your favorite non-dairy milk to your liking.